The concept of summer has often been associated with growth and maturity, especially when it comes to plant life. And indeed summer is the season of greatest plant growth in areas with healthy summer showers. For many farm workers, summer is a busy season filled with hard work under the hot sun. But summers on the farm also yield the special pleasures of the first ripe tomato, fresh corn on the cob, and sweet juicy peaches picked and eaten right from the tree. Festivals celebrating food are common this time of year. This is usually also a time for family vacations in the U.S., with trips to the seashore or a mountain lake and barbecues in the backyard. What are your favorite summer activities? 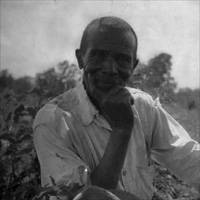 CREDIT: "African American Farmer, Texas." 1933. The John and Ruby Lomax 1939 Southern States Recording Trip, American Memory collections, Library of Congress. AUDIO CREDIT: Hill, Clyde, and a group of convicts from Clemens State Farm, Brazoria, Texas, performer. "Long Hot Summer Day." Recorded April 16, 1939. The John and Ruby Lomax 1939 Southern States Recording Trip, Library of Congress.